On 8th January 2013, we reported the discovery of two bull elk near Canmore, Alberta, showing signs of partial paralysis and apparent discomfort that was of sudden onset. There was general concern that either they had contracted an illness affecting the nervous system or had been exposed to a toxin such as those used in deer repellents. 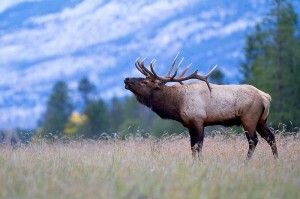 The larger of the two elk, with the most severe clinical signs, was euthanized first and submitted for necropsy at the Alberta node of the Canadian Cooperative Wildlife Health Centre (CCWHC), University of Calgary. It was found that he had multiple rib fractures and fractured vertebrae that would have accounted for the partial paralysis observed. The second elk survived another week but was eventually euthanized and upon further examination he was also found to have rib fractures but less severe than in the larger animal. The appearance of the fracture sites suggested that the two elk suffered blunt force trauma at approximately the same time. Possibly struck by a large truck or a train, which is not an unusual history in the Canmore area. An interesting observation in the second elk was a penetrating wound in its forehead associated with an abscess of the brain. The age of the wound was estimated to be several months and probably originated with either an antler wound sustained during the fall rut, or from the introduction of bacteria caused by an abrasion of the skin when antler rubbing on trees or bushes during the rut. Similar pathology has been reported for rutting white tailed deer bucks in the US. Nevertheless, these are sad outcomes for these two animals but good news with respect to concerns that their illness might have represented some new and unexpected disease.